Have you ever wondered about microfiber or microfibre cloth? This incredible material has a huge history and a million uses. This guide to microfiber cloth will help you gain an educated insight and boost your understanding. Microfiber is a high density variety of polyester that has a plethora of positive and useful properties most other traditional and natural fibres do not have. Microfibers are roughly 100 times finer than a human hair, 1 third the diameter of cotton, half the diameter of fine silk and 1 quarter the width of wool. They are formed from polyamide and polyester fibres with a material density that allows it to grip up to 8 times its own weight in water. The resulting microfibre material is extremely lightweight and incredibly durable. The use of microfibre in everyday life came about because of its incredible ability to clean surfaces and to pick up very tiny particles without using an additional solvent. This is due to its high density and positively charged characteristics. Amazingly, microfibre cloth can disinfect and clean many surfaces, removing up to 99% of bacteria and germs without additional chemicals which has resulted in reduced chemical costs in many hospitals and other ‘clean’ environments. Interesting Fact: Ultra-microfibers can be the thickness of just 1/200th of a human hair! Although the manufacture of ultra-fine fibres can be traced back to the late 1950’s, microfiber didn’t come about until a couple of decades later in the 1970’s. Its inventor was a Japanese scientist by the name of Dr. Miyoshi Okamoto who guided microfiber cloth into existence whilst working for Toray Industries in Japan. Interesting Fact: Ultrasuede® is the trademark name for the first microfibre cloth and is still used today. Okamoto and his colleague Dr. Toyohiko Hikota spent years trying to develop the material that would go on to be initially named ‘Ultrasuede’. The new material would not make commercial production until 1989 and was put into production by E.I. DuPont de Nemours & Company (DuPont as we know it now). It is also claimed that microfiber was introduced in England UK in 1986 which is before the generally accepted historical timeline. There are also other unsubstantiated claims as to where and when microfiber first entered commercial production. What is true though is that microfibre has become an everyday part of our working and home lives. Microfibres were created using a process involving melt-blown spinning and flash spinning. This resulted in random, intermittent length fibres for which there were very few uses. Continued experiments were made in the production of a continuous filament which led to a resulting material with multiple industrial applications. 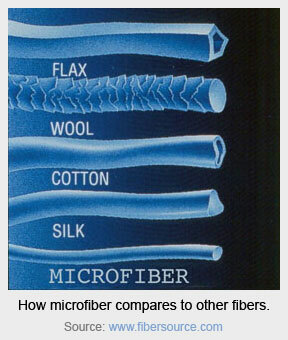 Spelt either microfiber or microfibre, the name refers to man-made synthetic fibers that are 1.3 denier or decitex. Obvious comparisons with human hair show that a microfibre can be 1/100th the diameter and 1/20th the diameter of a single strand of silk. Microfibre is commonly made up of a blend of polyamide and polyester. Other recognised products made from similar processes are Kevlar and nylon. Although it is available as a pure product, microfiber also comes as mixed with natural fibres such as wool, silk and cotton. Mixing it with other fibres can result in improved performance and visual appeal. These improvements have opened the door to the commercial successes and the diversity of microfibre cloth products available today. Variations of microfibre are used to make cleaning cloths, mats, clothes, upholstery and many, many more products. Interesting Fact: ‘Denier’ is the word that describes the diameter or ‘fineness’ of fibre. The many uses of microfibers. Because of the flexible and strong polyester and nylon fibres, microfibre has a multiplicity of of diverse uses. It is used in many textiles, apparel, dress making and so on. It is widely used in the making of fleece jackets, suit jackets, all kinds of sportswear, jogging suits, body wear and is a very popular alternative to cotton. It has become incredibly popular with sportsmen and women because its wicking ability helps it to effortlessly breathe and filter away the body’s humidity. This helps keep the athletes skin cool and free from perspiration. Microfiber products have also cornered aspects of the outdoors market with cloth variations being used to manufacture sleeping bags, tents and blankets. Inside the home there are a plethora of microfibre cloth based products such as cleaning cloths, dusters, napkins, luxurious fabrics, sheets, pillow cases, upholstery, the list is endless. They have been used in the production of lingerie, stockings, blouses, sanitary products, babies’ nappies and even artificial blood vessels. Interesting Fact: In 2012 almost 141 million square meters of microfiber leather was produced. Was initially a polyester driven material but is now also found in nylon, acrylic and rayon. As we have learnt already, there are different variations of microfibers so taking care of them can be different to. Microfibers from similar fibre groups can usually be treated the same, the most notable examples being polyester and nylon that are usually treated the same as other fabrics produced from these materials whereas viscose rayon is better off being dry cleaned and polynosic fibres are machine washable. Because the microfibers have a very fine denier, heat can penetrate the fibers much more quickly than other fibers and melting or scorching can occur. So when the heating is turned on and there is low humidity the fibre can build up static so it’s important to be aware of this. Microfibers are made from petrochemicals and are for the most part a flammable material, the substances used in its production emit toxic gases is burnt. Unfortunately they are not environmentally friendly and are not biodegradable or made from renewable sources. Microfibre production creates the greenhouse gas nitrous oxide which is over 300 times more potent than carbon dioxide gas. On the positive side they do reduce water usage and are very durable which keeps them in use for much longer periods of time than natural materials. A typical microfibre cloth can last a 1000 wash cycles so you can see how long lasting they can be. Also for a lot of households and work places using microfiber has allowed people to eliminate cleaning products and chemical thereby reducing other forms of perceived pollution. Well, we hope you’ve enjoyed reading this guide to microfiber cloth. Microfiber is an amazing product and its arrival changed the way we do a lot of things both around the workplace and the home. However you feel about this cloth its versatility and durability is unquestionable. It has replaced a whole swathe of natural fibres used in our daily life with its chemical free cleaning ability being very welcomed right across the globe. 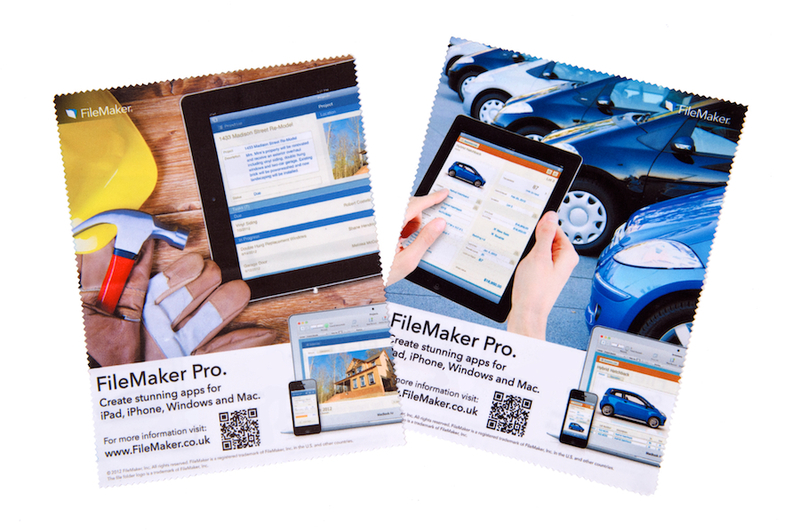 Global offers wholesale branded & printed microfiber cloths to both UK & International customers. We also have a wide range of other promotional products such as silicone wristbands, lanyards and custom slap bands to help get you noticed in the competitive world of business.